The last surviving member of the Andrew Sisters, Patty Andrews died on January 30, 2013 at her residence in Los Angeles. The Andrew Sisters were highly popular and their music became a part of the patriotic fabric of World War II America. Patty was 94 years old and Lynda Wells , a niece of Andrews confirmed the death. 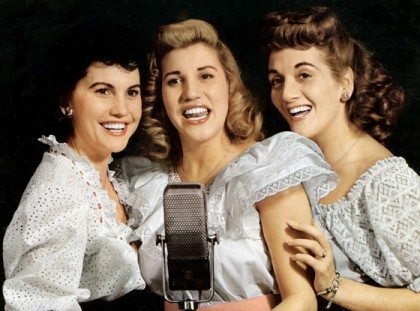 The Andrew Sisters were known for songs like ‘Rum and Cola-Cola’, ‘Boogie Woogie Bugle Boy (of Company B)’ and ‘Don’t Sit Under The Apple Tree (With Anyone Else But Me)’. The sisters Maxene, Patty and LaVerne made movies, performed with Bing Crosby and with the Glen Miller Orchestra and entertained the American troops overseas. Patty was the youngest among the sisters who began singing together as children, by the time they became teenagers they had formed a vocal group. The sisters also modeled their act on the commercially successful Boswell sisters and sang at county fairs and vaudeville shows. The sisters came into the lime light in the year 1937 when they were signed by Decca Records, but their first recording went unnoticed. Other hits from the group followed and in the year 1940 they were signed by Universal Pictures.